This landscape in Black Forest blends function with nature. It creates beautiful usable space while seamlessly integrating and emphasizing its forest surroundings. The front yard has a small lawn area for that splash of color. 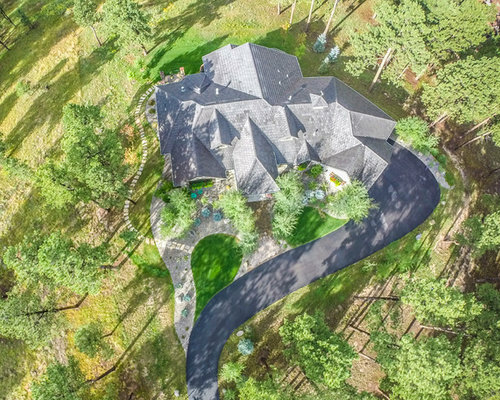 The use of aspen, evergreen shrubs, and native flowers such as daisies make this a prefect fit in the forest. 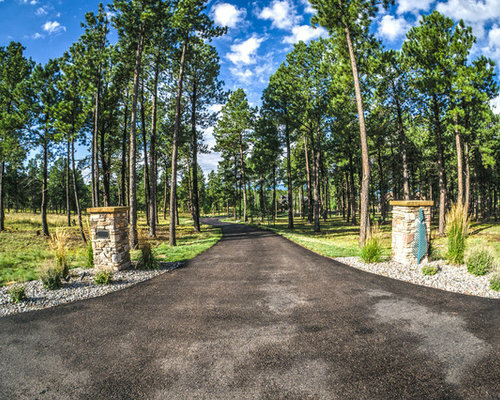 The colorful planting bed, blending in with the surrounding trees and native grasses, creates a lovely focal point at the end of the drive. 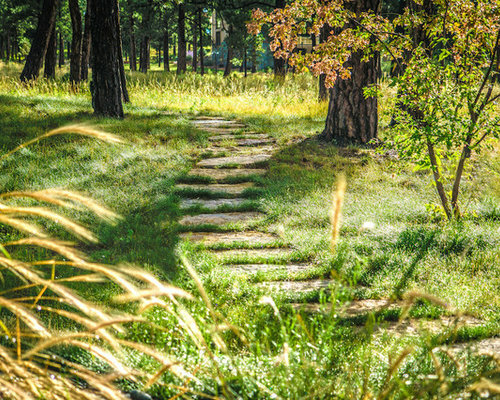 The Siloam stone path provides easy access throughout the landscape. 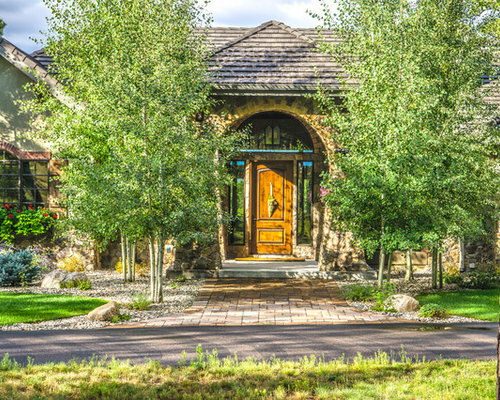 The use of natural stone alongside the the aspens, evergreens and native plantings give a rustic yet refined feel. 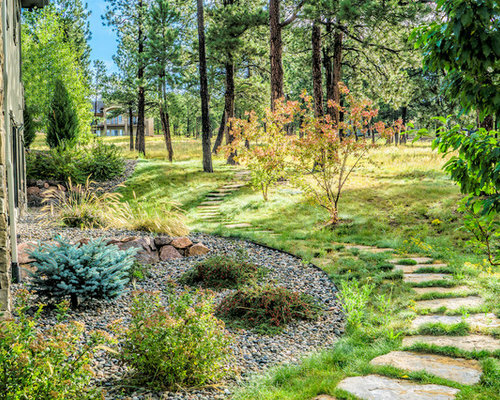 The Siloam stone path meanders alongside the planting bed, through the native grass and pines. The Amur Maple add a wonderful splash of color. 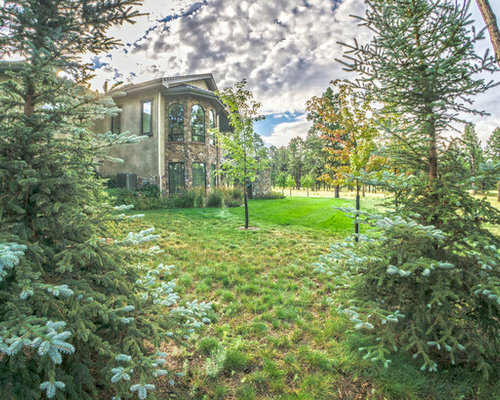 Utilizing native grass adds great impact to a landscape at a low cost. 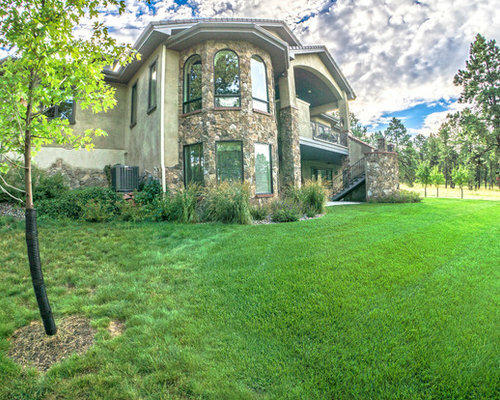 Native grasses are very water friendly, and require less maintenance than traditional turf. 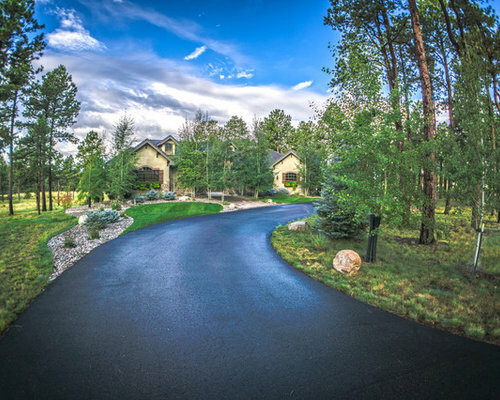 The transition from the finished landscape to to native landscape blends beautifully, tying the whole property together. 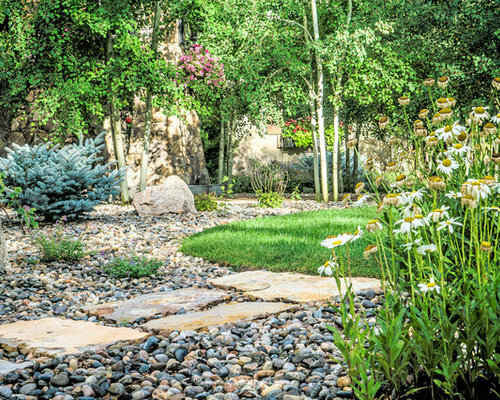 The natural stepping stones weaving its way throughout the landscape adds a whimsical element as well as function. 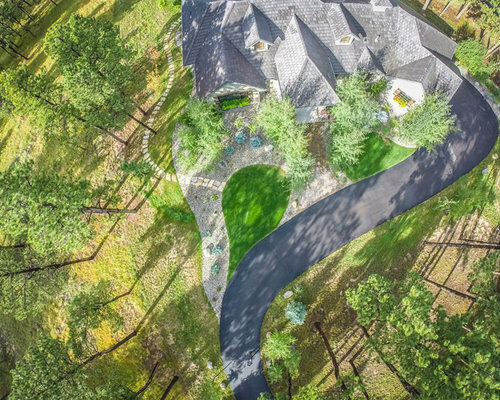 The birds-eye view shows the entire project. 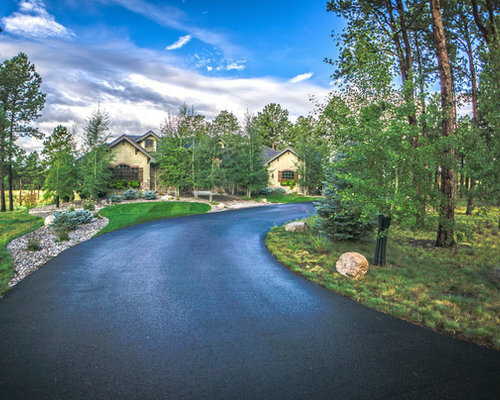 The landscape transitions seamlessly into its picturesque surroundings. 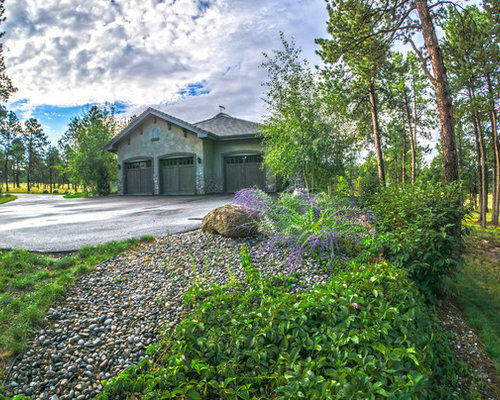 The front yard utilizes multiple elements to create interest. 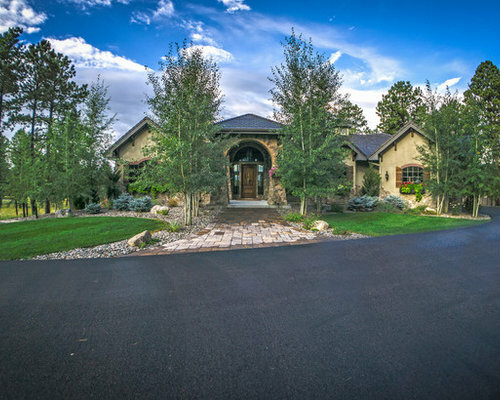 The paver walkway creates a welcoming entry to the home, the natural stone walk blends nicely with its surroundings and give a rustic look, while the planting selection provides year round color and interest. The spruce and Amur Maple are wonderful additions to the Native pine. The mixture of conifers and deciduous trees provide various color and interest all year. The tradition blue grass turf and native grass blend together very nicely. 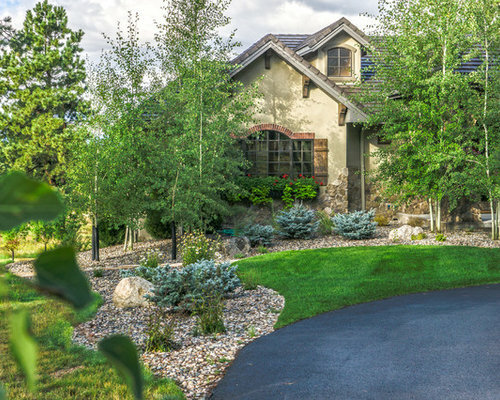 The lawn provides an area the family can play and enjoy, while the native grass still gives color to the surroundings, with the advantage of needing little water and maintenance. The approach to the home is quite welcoming, while still giving an element of privacy. Stone columns provide an excellent focal point when houses have a further set back from the road. Low voltage outdoor lighting provides low cost visibility, and really makes the columns stand out at night. 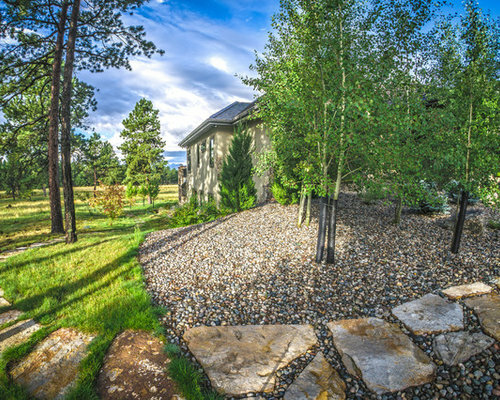 The front yard provides many different elements, including pavers, turf, trees, colorful plantings, and evergreens, tied together to create a unique and interesting landscape.